All Sizes and Weights Available! We carry a variety of sizes and weights of both Kraft (brown) and Butcher (white) papers. 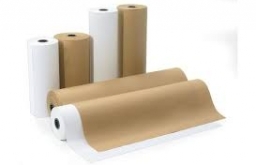 Our Kraft paper is a good quality, low cost all-purpose packaging material good for wrapping and void fill, as well as for covering work areas, packaging, and product. Our Butcher paper is designed to provide maximum protection for fresh meat and poultry, F.D.A. approved. Uses for Butcher Paper include: Sign Paper, Arts and Crafts, Table Covers, Food Interleaving, Pharmaceutical, Cookie and Candy Manufacturing. Our standard stock sizes range from 12" to 72" and are standard weights range from 30# to 60#. Special sizes and weights are available for order as requested! All Sizes and Gauges Available! We carry American-made AmTopp Brand, with access to all widths, lengths, and gauges of hand and machine length films, including High Performance and micron films. Pre-stretched and other brands are available upon request. Our standard AmTopp Brand stretch is a linear low-density film used for wrapping pallets to ensure safe transport and storage of products. Our High Performance hand film is specifically designed to wrap irregularly-shaped palletized products. 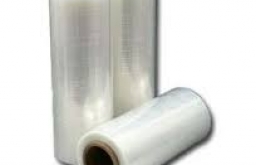 High Performance film is excellent for use in roping, bundling, and spiral applications. Also available is our small banding film measuring in width from 3" - 5". Our standard stock sizes range from 12" to 20" for hand, and 20" to 40" for machine. Standard gauges run from 45 to 90. Special sizes, gauges, and microns are available for order as requested! 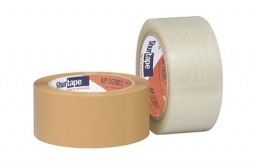 We carry a full line of Acrylic, Rubber, and Hot-Melt carton-sealing tapes, hand and machine lengths, clear and tan colors, from brands including 3M, Shurtape and Intertape. Please click here to see a sampling of our stock items.